These concepts are diverse, coming from different perspectives with different methods and archetypal case studies. But there are shared themes: a focus on more diffuse and polycentric urban forms; recognition of city connections across multiple scales; and the rise of ever larger urban regions embedded in thicker global networks. Representing and exploring the diversity of contemporary global urban forms is a challenge for cartographers. 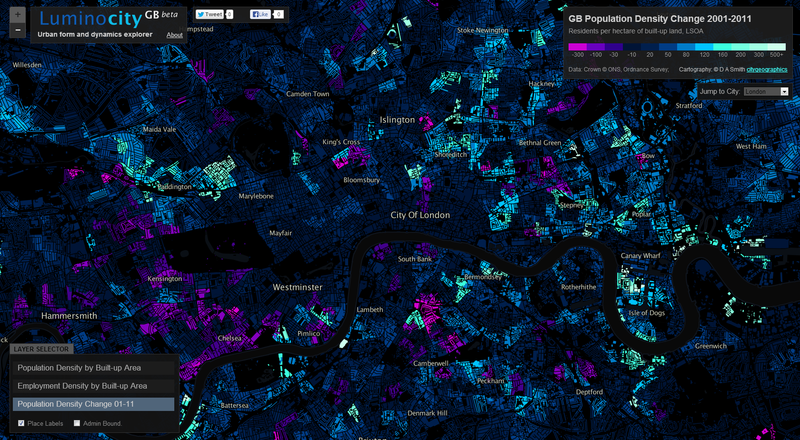 We often focus on mapping the amazing richness and diversity of dominant global cities like London and New York. Yet this is clearly a very biased lens from which to frame the vast majority of the globe, as researchers have noted. Postcolonial critiques like Robinson’s ordinary cities (2006) argue for a much more representative and cosmopolitan comparative urbanism. From a different angle, provocative research like Brenner’s (2014) ‘planetary urbanism‘ has critiqued the contentions of a universal urban age, arguing that urban/rural distinctions are no longer meaningful where capitalist networks reach to every corner of the globe. I recently released an interactive map of the new Global Human Settlement Layer (GHSL) produced by the European Commission JRC and CIESIN Columbia University. This dataset makes several advances towards an improved cartography of the diversity of global urbanism. Firstly it is truly global, representing all the world’s landmass and settlements at a higher level of detail, down to 250m. Secondly the population density and built-up layers are continuous: there are no inherent city boundaries or urban/rural definitions (the GHSL includes an additional layer with urban centres defined, but the user can ignore these and create their own boundaries from the underlying layers). Thirdly the dataset is a time-series, including 1975, 1990, 2000 and 2015. Finally the data layers and the methods used to create them are fully open. The complexity and scale of the GHSL data is both beautiful and beguiling. In China and India there are continuous landscapes of connected urban settlements with hundreds of millions of people, scattered across many thousands of square kilometres. The cartographic appearance of these regions is like constellations of stars coalescing in vast nebulae of diffuse population. Densities of South and South-East Asian towns and small settlements in semi-rural regions exceed many major cities in Europe and North America. These are complex evolving landscapes at a scale and extent unprecedented in the history of urbanism. Similarly there are unique trends in other major regions of urbanisation such as Latin America. Here major centres are very high density, but the extent of diffuse rural populations is far less prevalent. As a result countries like Colombia and Brazil have some of the highest urban population densities in the world. The recognition of this global diversity does not mean abandoning global theories of urbanism. Even amongst such complexity and diversity, we can still observe shared spatial patterns and connections. Clearly we are observing landscapes heavily influenced by our current era of intense globalisation, as well as retaining inherited patterns from previous eras. Spatial logics of globalisation are apparent across the globe, though differentiated between regions, economies and societies. 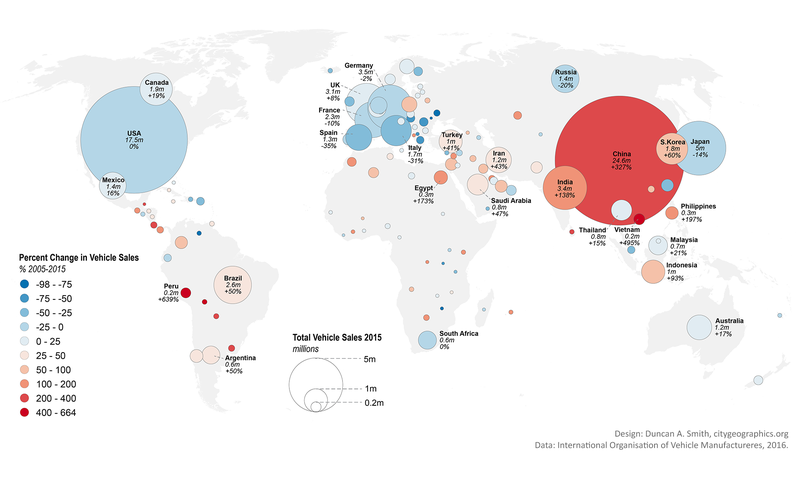 The pull of coastal areas for global trade is an obvious spatial pattern. The importance of port cities is also applicable to historic periods of ancient civilisations, and indeed to globalisation in the 18th and 19th centuries. But the difference in the 20th and 21st centuries appears to be the more intensive links between major ports and global megaregions of production and manufacturing. We can observe this in the huge megaregions of China: the Pearl River Delta and Yangtze Delta (both with around 50m population depending on where the boundary is drawn), which are China’s leading manufacturing centres. It also applies to Europe, with the higher density spine of the ‘blue banana’ linking low country ports to manufacturing centres in western Germany and north-eastern France, and more loosely to south-east England and northern Italy. As well as the manufacturing roles, it is clear that most major global financial centres are closely linked to megaregions, either at their core (e.g. Shanghai, New York, Tokyo) or within a couple of hours travel (e.g. Hong Kong, London, Paris). These centres provide the capital and business services that embed megaregions in global networks. The importance of ports is also evident in South Asia. Port cities in South Asia are amongst the fastest growing in the world, such as Dhaka, Mumbai, Karachi, Kolkata and Chennai. But megaregions here appear as yet to be less extensive and well connected. Latin American cities are even more spatially separated and precisely defined in density terms, though there are signs of increasing connections between for example the two great Brazilian metropolises, Sao Paulo and Rio de Janeiro, and in the north between Venezuelan and Colombian port cities. Another fascinating pattern relates to large previously rural areas of population in developing countries that are urbanising in more diffuse and bottom-up patterns. McGee used the term desakota (village-city) to describe patterns of disperse rural development in Java Indonesia. There appear to be similar patterns emerging across regions of China and India, including many areas of the vast Ganges plain, and along the great rivers of China. One of most striking features in China is the concentration of semi-rural and urban populations radiating south-west from Beijing towards Shijiazhuang and then south towards Zhengzhou (this follows one of China’s oldest rail routes, built 1903 and is nearly 600km long). There are several areas of sub-Saharan Africa where desakota-like patterns seem to be apparent. The west coast around Nigeria and Ghana is one such area. Another is the many developments around Lake Victoria in Uganda, Kenya and Tanzania. Clearly the cultural and geographical diversity is very high in these regions, and my own knowledge of these countries is very limited. But the similar density patterns is still of interest. 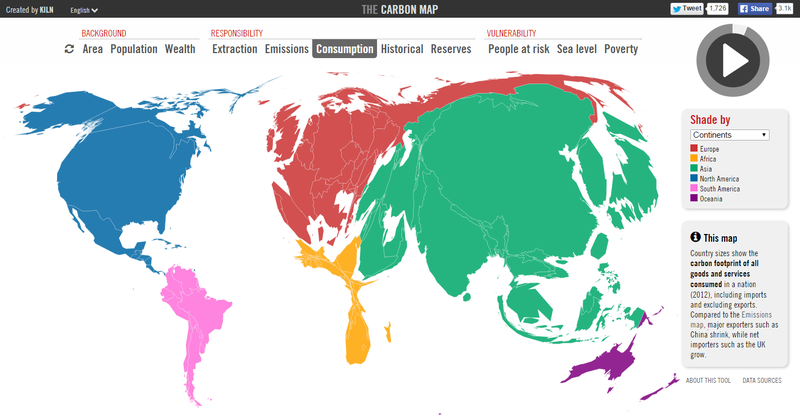 The World Population Density map includes density statistics at national and city scales, with population totals classified into density groups (turn on the Interactive Statistics button at the top left). These help to identify differences in patterns of settlement, and how city densities relate to national distributions. If we view the world’s highest density cities, we can see the clear links to the above discussion of urbanisation in South Asia and East Asia, and major global port cities. Note however there are many issues with defining and measuring density, which need to be borne in mind when interpreting such statistics. These are measures of residential density, and results will likely be affected by the scale and accuracy of the underlying census data. It would also be better statistically to measure peaks as the 95th or 99th percentile to prevent a single square km cell skewing the results, as there are some outliers in the results. We can also consider the highest population city-regions based on the GHSL urban centre boundaries. These are defined as continuous built-up areas, with polycentric regions linked into single cities. 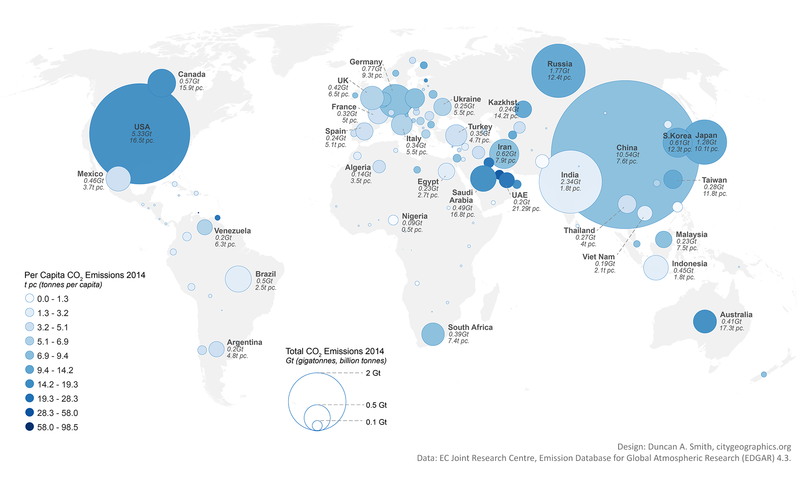 This leads to quite different results for world’s largest cities, with the Pearl River Delta measured as the world’s biggest urban agglomeration at 46 million (and that’s not including Hong Kong or Macao). 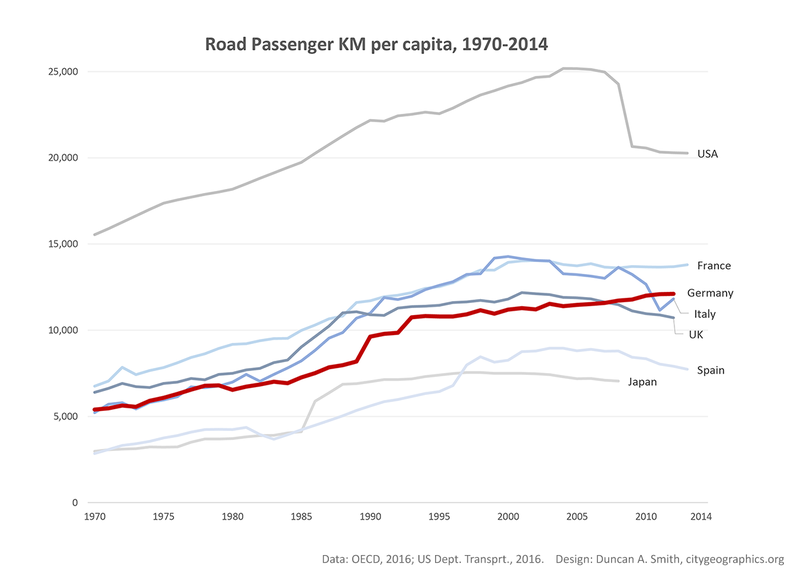 It is interesting to compare this to results from the UN World Urbanisation Prospects data, which keeps these regions as separate cities and identifies Tokyo as the world’s largest city-region. Population density is clearly a very useful base from which to understand urbanisation and patterns of settlement. 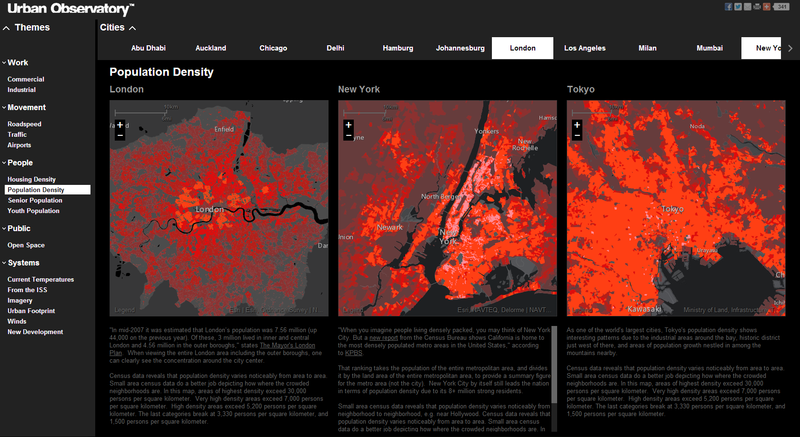 But we can also see its limitations too in the World Density Map if urbanisation is viewed only in terms of density. Many US city-regions are very low density, much lower than semi-rural parts of Asia and Africa, but these US cities are amongst the most affluent and highly urbanised areas of the globe. Clearly a more comprehensive cartography of global urbanism would combine population density with measurements of development and economic activity, and the flows of people, goods, energy and information that describe the dynamics of how cities and networks function. 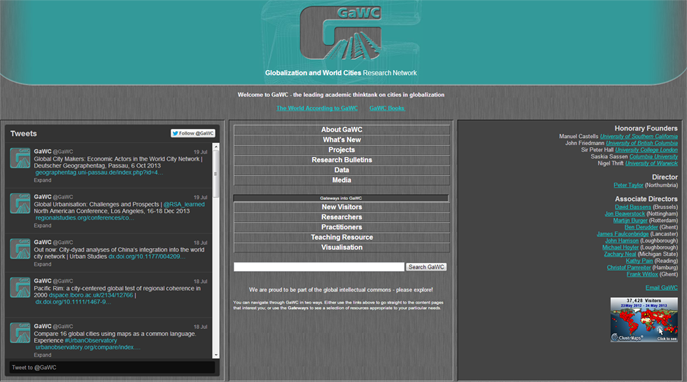 The development of open global datasets like the GHSL will greatly help in these endeavours. Another important issue is improving the sophistication of spatial statistics to include multiple urban boundaries and limit Modifiable Areal Unit effects. This would be possible with the GHSL dataset, and I have tried including national and city statistics, but clearly MAUP effects remain when using fixed city boundaries. Something along the lines of my colleagues’ research testing statistics for multiple boundaries simultaneously and showing their influence would be a good avenue to explore. The World Population Density map is exploratory, as the dataset is very rich and new, and I am also testing out new methods for navigating statistics at both national and city scales on this site. There are clearly many applications of this data in understanding urban geographies at different scales, urban development, sustainability and change over time. A few highlights are included here and I will post in more detail later when I have explored the dataset more fully. The GHSL is great for exploring megaregions. Above is the northeastern seaboard of the USA, with urban settlements stretching from Washington to Boston, famously discussed by Gottman in the 1960s as a meglopolis. Europe’s version of a megaregion is looser, but you can clearly see the corridor of higher population density stretching through the industrial heartland of the low countries and Rhine-Ruhr towards Switzerland and northern Italy, sometimes called the ‘blue banana’. The megaregions of China are spectacularly highlighted, above the Pearl River Delta including Guangzhou, Shenzhen and Hong Kong amongst many other large cities, giving a total population of around 50 million. The Yangtze Delta is also home to another gigantic polycentric megaregion, with Shanghai as the focus. Population estimates range from 50-70 million depending on where you draw the boundary. The form of Beijing’s wider region is quite different, with a huge lower density corridor to the South West of mixed industry and agriculture which looks like the Chinese version of desakota (“village-city”) forms. This emerging megaregion, including Tianjin, is sometimes termed Jingjinji. The term desakota was originally coined by McGee in relation to Java in Indonesia, which has an incredible density of settlement as shown above. There are around 147 million people living on Java. The intense settlement of Cairo and the Nile Delta is in complete contrast to the arid and empty Sahara. Huge rural populations surround the delta lands of West Bengal and Bangladesh, focused around the megacities of Kolkata and Dhaka. There is a massive concentration of population along the coast in South India. This reflects rich agriculture and prospering cities, but like many urban regions is vulnerable to sea level changes. The comprehensive nature of the GHSL data means it can be analysed and applied in many ways, including as a time series as data is available for 1975, 1990, 2000 and 2015. So far I have only visualised 2015, but have calculated statistics for all the years (turn the interactive statistics on at the top left of the website- I’ll post more about these statistics later). Change over time animations would definitely be an interesting approach to explore in the future. Also see some nice work by Alasdair Rae who has produced some excellent 3D visualisations using GHSL. I have a new paper published in Computers Environment and Urban Systems- Online interactive thematic mapping: applications and techniques for socio-economic research. The paper reviews workflows for creating online thematic maps, and describes how several leading interactive mapping sites were created. The paper is open access so you can download the pdf for free. The paper features web mapping sites by Oliver O’Brien (http://www.datashine.org.uk), Kiln (http://www.carbonmap.org) and Alec Friedoff at Brookings (http://www.brookings.edu/research/reports2/2015/01/22-global-metro-monitor). Many thanks to these cartographers for agreeing for their work to be included in the paper, particularly Ollie O’Brien who also kindly provided comments on the paper draft. Also many thanks to Steven Gray at CASA who set up the hosting for the LuminoCity3D site. Recent advances in public sector open data and online mapping software are opening up new possibilities for interactive mapping in research applications. Increasingly there are opportunities to develop advanced interactive platforms with exploratory and analytical functionality. This paper reviews tools and workflows for the production of online research mapping platforms, alongside a classification of the interactive functionality that can be achieved. A series of mapping case studies from government, academia and research institutes are reviewed. The conclusions are that online cartography’s technical hurdles are falling due to open data releases, open source software and cloud services innovations. The data exploration functionality of these new tools is powerful and complements the emerging fields of big data and open GIS. International data perspectives are also increasingly feasible. Analytical functionality for web mapping is currently less developed, but promising examples can be seen in areas such as urban analytics. 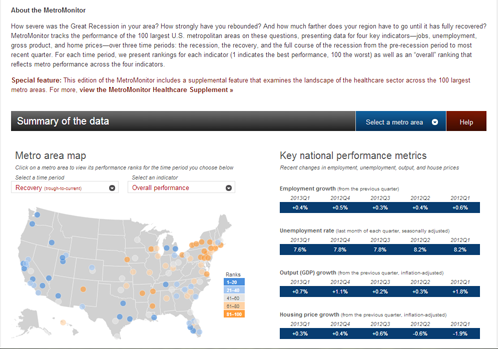 For more presentational research communication applications, there has been progress in story-driven mapping drawing on data journalism approaches that are capable of connecting with very large audiences. It’s been 14 years since the landmark Urban Task Force report, which set the agenda for inner-city densification and brownfield regeneration in the UK. Furthermore we’ve seen significant economic and demographic change in the last decade that’s greatly impacted urban areas. 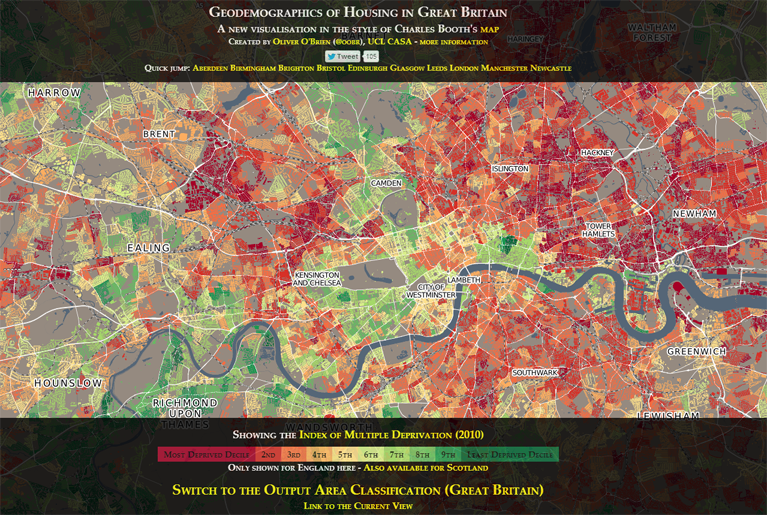 We can now use the 2011 census data, mapped here on the LuminoCity GB site, to investigate how these policies and socio-economic trends have transformed British cities in terms of population density change. The stand-out result is that there’s a striking similarity across a wide range of cities, with overall growth achieved through high levels of inner-city densification (shown in lighter blue to cyan colours) in combination with a mix of slowly growing and moderately declining suburbs (dark purple to magenta colours). We can see this pattern in the growing urban regions of Manchester, Birmingham, Leeds and Sheffield above. Manchester has the fastest population growth after London, with 8.1% growth in the city-region, and a massive 28% growth in the core local authority. 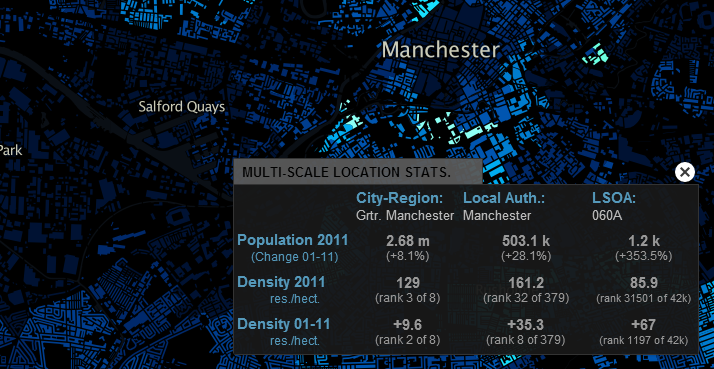 Average densities in Manchester have gone up by 28% (+35 residents per hectare), but it’s not a uniform growth. There are new development sites at a very high 300 or 400 residents per hectare, contrasting with low density surrounds and the extensive remaining brownfield sites. There is a patchy nature to the current urban fabric of Manchester, indicating that much further development could still take place. The West Midlands Conurbation is the third fastest growing city-region at 7.3%, with a higher 10% growth in the core city authority Birmingham. Density increases are more modest here (+13 residents per hectare) but the same general pattern remains. Similar patterns of high density inner-city growth are also clear in Leeds (5% growth) and Sheffield (8% growth). Meanwhile the UK’s former industrial powerhouses of Glasgow, Liverpool and Newcastle display a more problematic variation on this pattern. City centre intensification is still much in evidence, with core city authority populations growing at 8% in Newcastle, 6% in Liverpool and 4% in Glasgow. But this growth is in combination with outright decline in some surrounding towns and suburban areas, particularly around Glasgow. These patterns are linked to major programmes to overhaul poor inner-city housing stock, but are also inevitably linked to weaker economic growth in Glasgow and Liverpool. The picture is better in Tyne & Wear, where there are more positive employment signs (8% growth in workforce jobs 2001-2011). 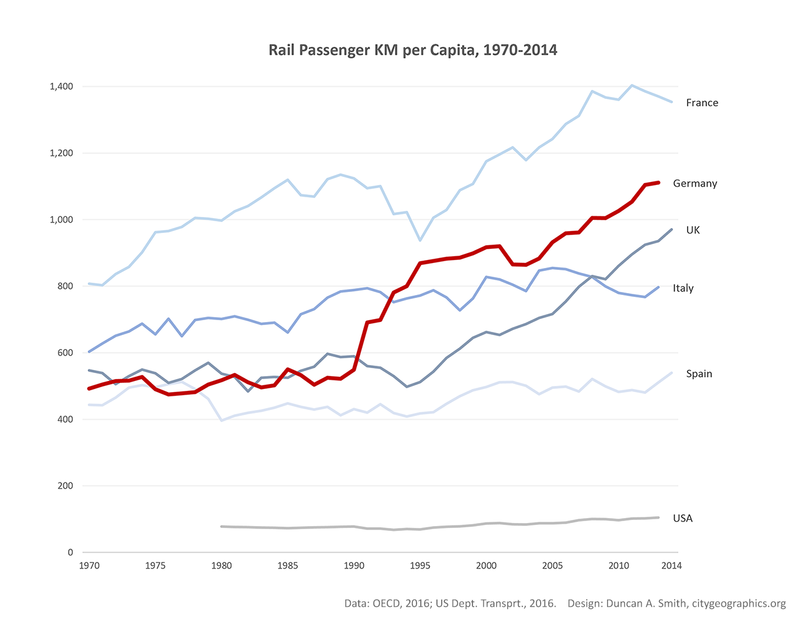 What is driving this urban dynamic? In addition to planning policy shifts, a series of economic and demographic changes are contributing to the pattern of central growth and struggling suburbs, as commentators have variously been observing in the UK and US (e.g. gentrification researchers, Erenhalt, Kochan). Demographic aspects include more students, immigrants, singles and childless couples. Economic aspects include city-centre friendly service and knowledge economy jobs, as well as increased costs of petrol. 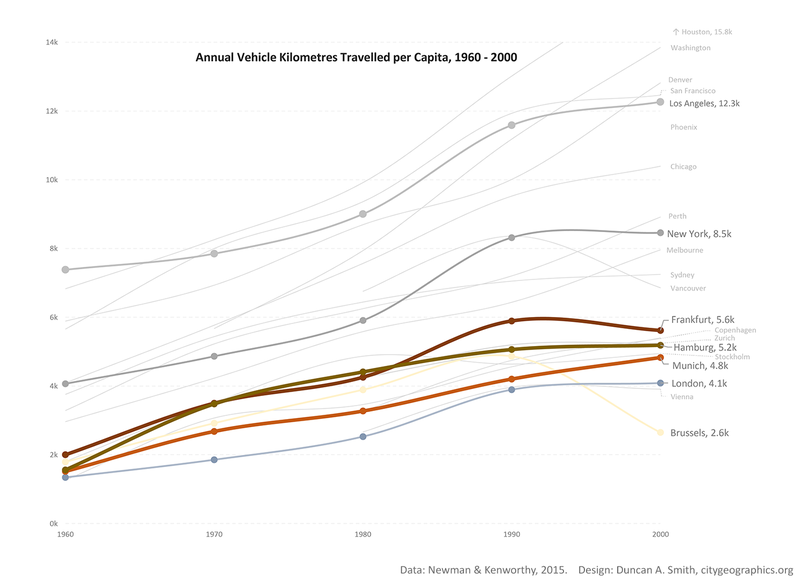 For these trends to occur over a wide range of demographically and economically diverse cities in the UK and beyond, clearly there are multiple factors pulling urban populations and growth in similar directions. We’ve avoided the gigantic outlier of London so far. It’s a city apart in many ways- much larger (8.1 million in the GLA area) and faster growing (+14% 2001-2011). It’s also massively higher density, with average residents per hectare 50% higher (nearly 200 residents per hectare) than the next most dense city-region in GB. The biggest changes have been in Inner East London. Tower Hamlets (where Canary Wharf has boomed) is 1st on every indicator- highest population change (+28.8%), highest employment change (+50%!! ), highest population density (324 residents / hectare). The pressures for growth in London are so high that there is little surburban decline in population terms (although employment has been declining significantly in Outer London). Yet the high rate of densification in London has come nowhere near meeting housing demand. London is the midst of a massive housing shortage and crisis, with some of the world’s highest property prices. The debate is currently raging about what needs to be done to accelerate construction, with advocates of transforming more land to community ownership (e.g. Planners Network UK), relaxing planning regulations such as the green belt (e.g. LSE SERC), and implementing an array of measures simultaneously (e.g. Shelter Report). We can see London’s challenges in the maps, such as the failure thus far of the flagship housing expansion programme, the Thames Gateway, to deliver. Some high profile development sites like Stratford and Kings Cross have only recently opened for residents and so do not show in the 2011 data. The Thames Gateway- aside from Woolwich, little housing has been delivered. Another more surprising result is the fall in the population of Inner West London, particularly Kensington and Chelsea. While this finding does need some context- K&C is still the forth most densely populated local authority in the country- it’s still an amazing trend given the extreme population pressures in London. It is in line with arguments that the most expensive properties in London have become investments for international capital rather than homes for living. Such trends push prices up, cut supply and bring questionable benefits to the city. Addressing this issue would require tax changes, and macro economic factors like the value of the pound and yields on alternative investments are also clearly influential. Well to state the obvious GB cities are, with only a few exceptions, growing significantly. That’s not to be sniffed at given the history of widespread urban decline throughout the second half of the 20th century. And secondly the pattern of growth in density terms is clear- densifying inner cities, and fairly static or declining suburbs. The scale of London and the severe housing crisis has it’s own unique dynamics, while Glasgow and Liverpool are still dealing with significant population loss in many areas of the city region. 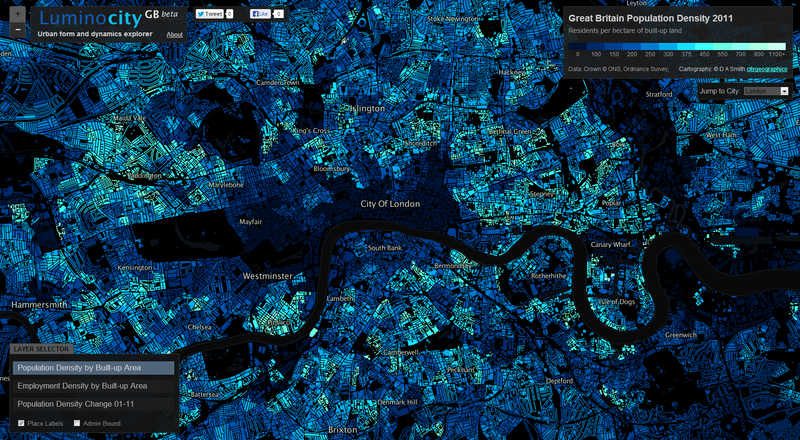 But on the whole, the pattern is surprisingly consistent across cities in Great Britain. Clearly this review prompts a series of further questions analysing the economic, demographic, gentrification, deprivation and property market processes inherent in this urban change, and what future city centres and suburbs will be like. Hopefully this mapping exercise should is a useful context for the ongoing research. Our cities have been changing dramatically in recent years, with the intensification of urban centres, redevelopment of old industrial spaces, new demographic trends, and the pressures of a volatile global economy. 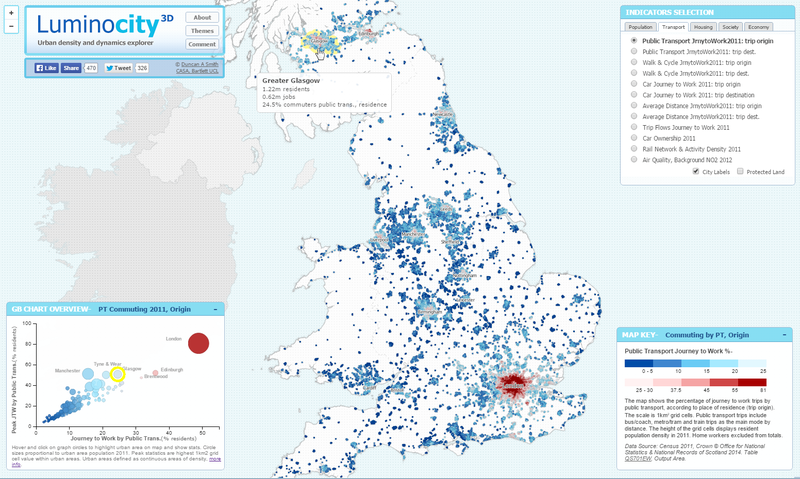 The aim of the LuminoCity website, which launches in beta today, is to visualise urban form and dynamics to better understand how these trends are transforming cities in Great Britain. Explore the site for yourself here- luminocitymap.org. The visual style developed for LuminoCity combines urban activity data with built-form. 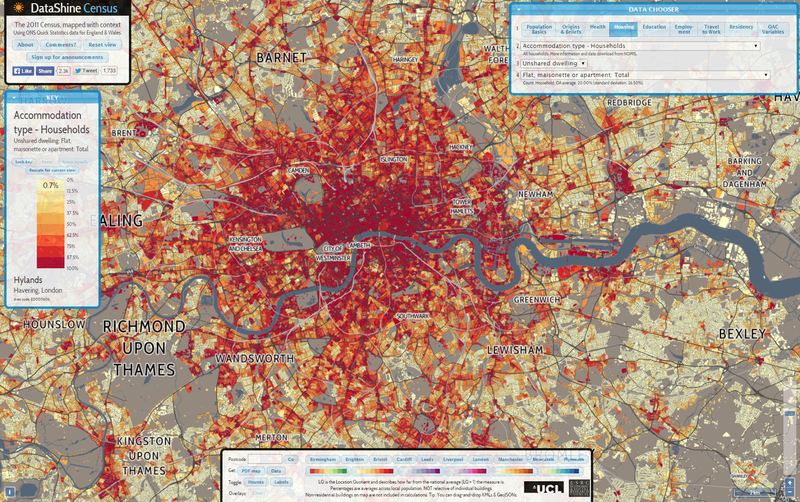 Density values are calculated by dividing fine-scale (LSOA) employment and population data by built-up area, and then mapping the results to the same building footprint data (Ordnance Survey VectorMap). The result is a novel city perspective on common demographic indicators like population and employment density, with links between density and the texture of the built-environment clearly highlighted. So for example in the London map above, we can see the patchwork pattern of recent high density developments in Docklands (along the river to the east), and high density clustering around major rail stations like Paddington. Each layer provides a complementary angle on urban form, with Employment Density showing business agglomeration patterns, and Population Density Change highlighting where intensification is occurring and where population losses are found. Examples of these three layers for major cities are shown above. The Population Density Change is particularly interesting in light of clear patterns of city centre growth and static or declining suburbs in many British cities, such as Manchester above. There is also in London a distinct pattern of population loss in the western inner-city, likely due to international capital speculation leaving under-occupied housing (see image below). These trends will be discussed in a further post later this week. As well as browsing the map you can also click on particular locations to get a set of core statistics and rankings of that area for the current map layer. The statistics are at three spatial levels- City Region, Local Authority and LSOA. This feature shows how typical a particular area is compared to the wider city-region and the country as a whole. It also helps to communicate the variation in density measurements according to scale. The data used for the LuminoCity site is Crown Copyright Office for National Statistics, National Records of Scotland and Ordnance Survey. Cartography and site design by Duncan A Smith. The map layers were produced using the excellent TileMill software by MapBox. The site concept was partly inspired by Ollie O’Brien’s ‘New Booth’ Map of Deprivation for Great Britain. The population data comes from the UK 2001 and 2011 Census, published by Office for National Statistics and National Records of Scotland. The employment data is derived from the Business Register and Employment Survey 2009-2011, also published by Office for National Statistics. The building footprint and urban area data is from the Ordnance Survey Vector District and Meridian products. These datasets have been published by the OS as Open Data, which is a fantastic recent development enabling sites like this to happen. All socio-economic mapping contains a degree of error, and the building footprint density approach used here introduces some issues. The Lower Super Output Area zone geography at which the population and employment data is published is fine scale but is not at the individual block level. Each LSOA zone represents groups of adjacent city blocks. The density results are therefore an average of the adjacent blocks in each zone. The results are affected by a particular version of the Modifiable Areal Unit Problem, and represent the density of fine-scale city neighbourhoods rather than of particular buildings. You can view the specific geography of the LSOA zones by turning on the ‘Admin Boundary’ layer on the LuminoCity site to see how blocks are aggregated. Additionally the analysis does not consider building use (there are several technical and copyright challenges with this) and so population and employment density measures include all buildings rather than distinguishing residential and commercial property densities. Finally, the ONS has not yet published census 2001 and 2011 population counts at the same LSOA geography, and a proportional spatial join method by building area was used to convert the 2001 LSOA census data to 2011 LSOAs for the Population Density Change layer. If you like the site or have any feedback or comments then you can tweet me @citygeographics, or email duncan2001@gmail.com. The site is in beta at the moment, and I plan to add more layers and interactivity in future releases. I’ll be blogging here in more detail about what the visualisations reveal about the changing geography of British cities over the coming weeks. ESRI Urban Observatory- the right model for city crowdsourcing? Furthermore this ambitious project is intended to be an extensible platform. Jack Dangermond (billionaire founder of ESRI) and Richard Saul Wurman (founder of TED with a long-standing interest in city cartography) discuss in the introductory video how they want many more cities to join in, to crowdsource city data from around the world, using the ArcGIS online platform. So is this project going to be the answer for all our global urban and smart city data needs? Well I think despite the great interface, as a city crowdsourcing model ESRI’s urban observatory is not going to work. But it’s interesting to explore why, particularly in relation to the bigger questions of whether the open city data revolution is going to be truly global and inspire a new era of urban analysis and comparative urban research. 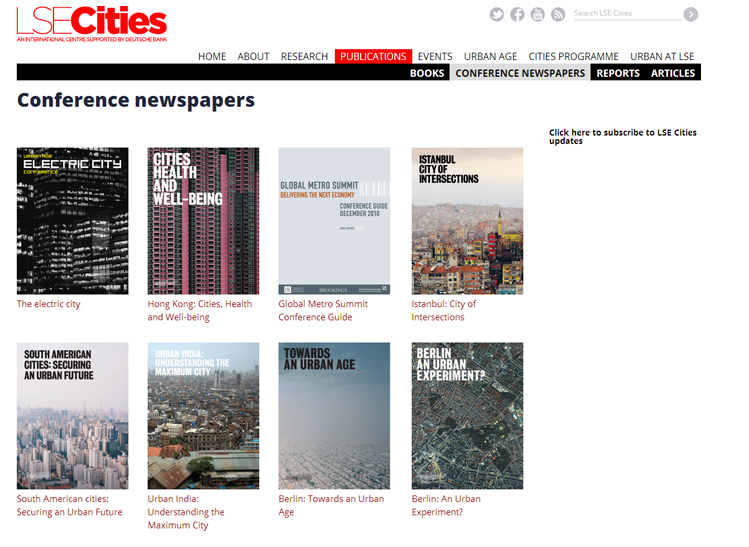 ESRI’s site states that “information about urbanization does not exist in comparative form”. In reality comparative urban analysis is a growing trend across many sectors, from international organisations like OECD, EU and UN (including the original UN Habitat Urban Observatory); to environmental organisations like ICLEI and C40; to economically focussed organisations like the World Bank and Brookings; to global remote sensing providers like the USGS; to major commercial data producers in transport and telecoms; to the many urban academic research centres around the world (including the two London based centres I’ve worked for, CASA and LSE Cities). CASA- deprivation in UK cities example. There’s a rich and growing field of data providers and analysis techniques to draw on for comparative urban analysis. Indeed the ability to gather and analyse urban data is absolutely central to the whole Smart City agenda. But there are clearly many challenges. What do cities gain by opening up their data? Who then owns the data and controls how it is presented? Who selects what data is included and excluded? I believe the natural platform for civic data (and subsequently for the international comparison of urban data) will be an open platform with wiki features to encourage civic engagement. This provides the answers to the above questions- citizens gain from better access to data and institutional transparency; citizens own the data and have a say in what is included and how it’s presented. This is the model for current successful open data sites like the London Datastore, where anyone can access the data, and Londoners can request new datasets (backed by freedom of information legislation). Unfortunately the governance situation is of course much more complicated for the international comparison of cities, and this has limited progress. As the world’s leading provider of GIS software, ESRI are in a strong position to integrate global datasets, and have clear commercial interests in amassing urban data for their clients. But it’s much harder to answer questions about who owns and controls data in their urban observatory project. Arguably this will limit the number of cities volunteering to take part, and limits the project’s ability to respond to the diverse demands of global cities and their citizens. A further huge challenge in comparative urbanism is in developing the right analytical techniques and indicators to answer key urban questions. This will inevitably require more sophisticated analysis tools than a set of thematic maps, and needs to draw on the many research strands developing the most relevant analytical tools. Overall there will be some exciting competition in the coming months and years in the expanding market of international urban data integration and visualisation, with different models from commercial, government and academic contexts. 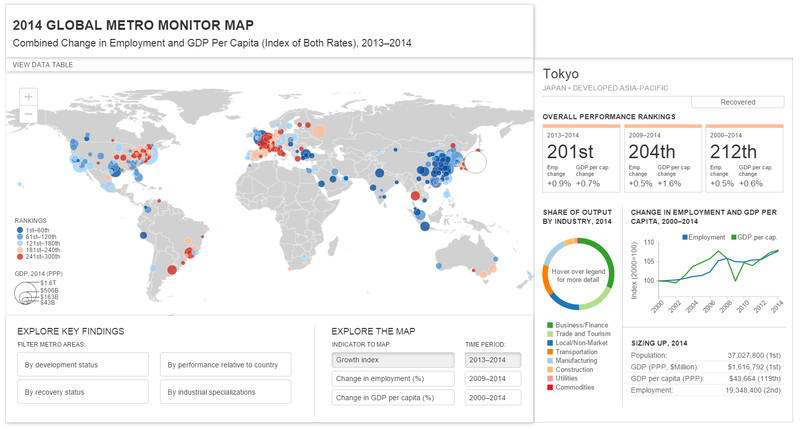 ESRI’s urban observatory is an innovative project, and should stimulate further advances.